Rhayader/Rhaeadr Gwy TownRhayader is a busy, historic market town, named after 'Rhayadr Gwy' a Welsh name for a local waterfall on the Wye. It is actually the very first town on the banks of the beautiful River Wye and has long been an important centre for the surrounding farming community with its flourishing livestock market. 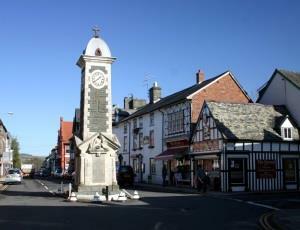 Rhayader is said to be the oldest town in mid Wales. Sitting in the shadow of the Cambrian Mountains at the upper end of the Elan Valley, Rhayader has a long history as a market town. Because of its location at a natural crossroads between east, west, north and south, Rhayader has welcomed travellers for centuries. In days gone by it was a very important staging post, especially for the London to Aberystwyth route. The mountain road from Rhayader to Cymystwyth is described by the AA as being one of the top 10 most scenic in the world. This lively market town is a great base for exploring the surrounding countryside and the town boasts lovely riverside walks, cycle routes and is the home to Welsh Royal Crystal. Water has always played an important role in the town and today visitors flock to the nearby Elan Valley where Victorian engineers created a series of magnificent dams and reservoirs as a water supply for the City of Birmingham some 70 miles away. Gigrin Farm, just outside the town, is a designated Red Kite feeding area, and visitors can watch the breathtaking aerial feats of these beautiful birds who have returned from the point of extinction in Wales. The town dates back to the 5th century, although Prehistoric evidence suggests earlier Bronze Age and Roman Settlements in the area. In 1177, the Lord Rhys of Deheubarth constructed a castle in the town, which sat at the very edge of his lands in order to resist Norman invaders, and in 1194 he rebuilt it, making it stronger and more durable to invasions. This castle was known as the Castle of Gwrtheyrnion, and like many castles in Wales passed hands between various Welsh princes and lords and the Norman invaders innumerable times until it was destroyed by fire in 1231 by soldiers from North Wales. During the 18th and 19th century sheep and cattle drovers crossing the Cambrian Mountains on their journey towards the English market towns of Banbury, Hereford and London would often stop at Rhayader for lodging and provisions. Its strategic position in the heartlands of Wales and at a crossroads meant that during the 19th century, no fewer than six toll gates were placed on the roads in and out of the town. This made journeys bringing animals into market expensive and became a real burden on the hard lives of the poor. When prices of stock fell and harvests were poor, these tolls became an impossible burden. As a result, between 1839 and 1844 the area witnessed mass rioting (known as the Rebecca Riots) when local people, angered by the increasing financial pressure followed a group of local tenant farmers and workers who dressed as women, known as Rebecca and her daughters. It is thought that the idea for disguise came from the Bible. In Genesis Rebecca recommended that some "possess the gates of those which hate them". 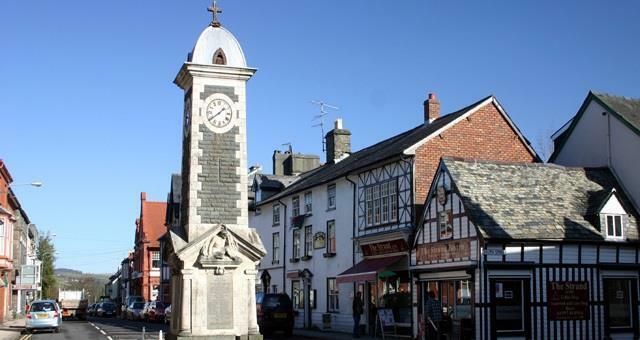 Rhayader is a busy, historic market town, named after 'Rhayadr Gwy' a Welsh name for a local waterfall on the Wye. It is actually the very first town on the banks of the beautiful River Wye and has long been an important centre for the surrounding farming community with its flourishing livestock market.